Coastal Living Idea Cottage – October Edition is Soon To Be Out! Monday was off to a great start, but little did I know that my quick trip to my personal PO Box would make Monday even sweeter! 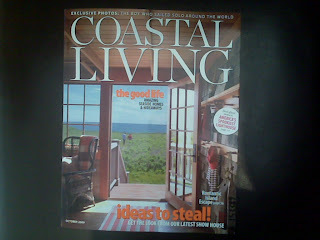 I reached in my box to pull out the long awaited October edition of Coastal Living magazine! I eagerly flipped through the pages to find the 2009 Idea Cottage we, (Structures Building Company) had the privilege of building was now staring me back in the face. Pages 35-55 show how the details were beautifully photographed by Tria Giovan. Tria flew down back in July and we’ve been holding our breath waiting to see this edition! The Coastal Living staff and local team did an amazing job from start to finish on this entire project, what a great little souvenir to say the least! This edition should hit the newsstands later this week. . . pick it up for some really fun and fresh ideas! Special thanks to Editor in Chief, Lindsey Bierman, Bill McDougald, VP, Southern Progress Homes Group, Nicole Hendrick, Idea Home Manager, and all many others from the Coastal Living team, Melissa Bigner, Freelance Writer for Coastal Living magazine, Tom and Vince Graham, Angie Hranowsky, local interior designer, Historical Concepts, Kerns Landscape Architects, Helen Geer of William Means and her incredible Sales and Marketing team and countless national and local sponsors! Hope you enjoy seeing how all your hard work has paid off!